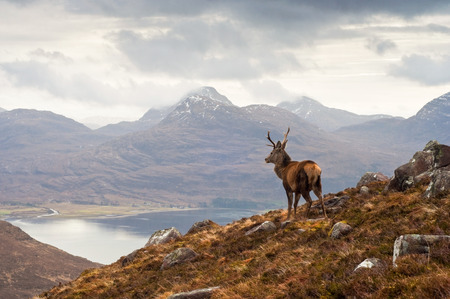 A stag overlooks Loch Torridon and the surrounding Torridon Hills in the breathtaking Wester Ross mountain range in north-western Scotland. Loch Torridon is a sea loch, opening into the Inner Sound between Skye and the Applecross Peninsula on the Scottish mainland. The Inner Sound contains the deepest of the UK’s territorial waters, reaching a maximum depth of 323 metres (1,062 feet). The loch is an important fishery for salmon and prawns, as well as mussels and other shellfish. Meanwhile the rocks on which the stag is standing are among the oldest in Britain. Torridonian sandstone dates to about 950-1,100 million years ago. The rock below it, Lewisian gneiss, is even older: at an estimated 2.4 thousand million years, it’s more than twice as old, or half the age of the Earth itself! This entry was posted	on Wednesday 28 February 2018 at 13:40	and is filed under 2018, Expat UK. You can follow any responses to this entry through the RSS 2.0 feed. You can leave a response, or trackback from your own site.